The weather has been influencing activities in the past few months, explains Keeper of the Wild José Acaro in a report from Laipuna, a reserve managed by Nature and Culture International – Ecuador (NCI). The 2013 rainy season in the dry forest was unusually short and the rainfall very low. This puts pressure on the forest because local farmers are short of food for their livestock. Sometimes they take down fences so that their cattle can forage in the reserve and while we are sympathetic to their needs it does considerable damage to the forest. As a result I have been spending a lot of time patrolling and repairing fences. Because we know that local people have found it difficult to feed their animals during the dry weather at NCI we have helped them develop small scale food production. This includes keeping and breeding hens and pigs, for example, as they do not need the same amount of food as cattle. As the main contact person for the community, I take a lead role in this and have been able to put farmers in touch with organisations who can provide them with the machinery they need to produce their own animal feed. By helping local communities we are also helping the forests. I took part in something completely different in August. A nine day meeting was organised to bring together rangers from five different conservation organisations in Ecuador, among them WLT’s three other Ecuadorian conservation partners: Fundación Jocotoco, Fundación EcoMinga and Fundación Pro-Bosque along with organisation Third Millenium Alliance. The meeting was organised and funded by IUCN National Committee of the Netherlands and other participants. During the meeting 12 rangers visited five different reserves: Cerro Blanco (Fundación Pro-Bosque), Buenaventura (Fundación Jocotoco), La Ceiba and Laipuna (NCI) and Jama Coaque Ecological Reserve (Third Millenium Alliance). It gave us a really good opportunity to see other reserves and discuss our various activities and to share our various experiences. It was a very useful and productive meeting. Laipuna Reserve is managed by NCI, one of World Land Trust’s (WLT) four conservation partners in Ecuador. 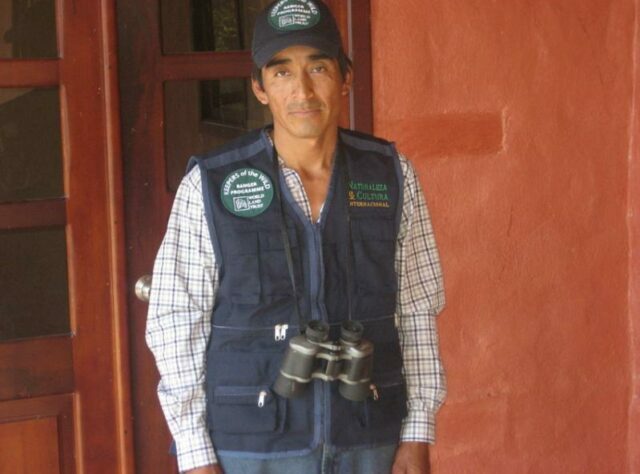 Jose’s employment with NCI is supported by WLT’s Keepers of the Wild programme. José does not speak English and we are grateful to Pedro Paladines of NCI for providing information in English about his recent activities. You can support the work of rangers like José and others by donating to Keepers of the Wild.